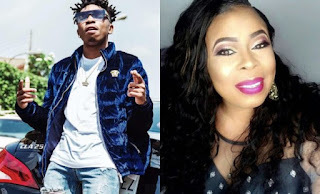 Veteran actress Toyin Adewale has begged and urged her son DMW star Mayorkun to not follow in the footsteps of his boss Davido. The actress has warned her son not to have a baby mama! Mayorkun revealed this in his snapchat story that his mother is always emphasizing about her fears of baby mamas. He shared a snapshot of their Facetime showing his mother’s face and hers during a conversation “Our face when she starts the don’t have a baby mama conversation starts” He wrote. Meanwhile, Mayorkun has said he’ll be married in six years!